DriveClub may be joining Watch Dogs in slipping from a launch title to a 2014 release. It hasn't been a good week for the next-gen launch lineup. Following the news that Watch Dogs won't be arriving on launch day as planned, a rumor has been circulating that the release date of DriveClub has been pushed back, too. 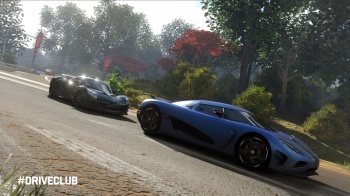 DriveClub is meant to be a launch title for the PlayStation 4, and if this rumor is true, the console's launch lineup will be two big-name entries shorter than expected. A site called The Same Coin first reported the rumor after being informed by an anonymous source. It wasn't much of a substantial lead, but in the following hours multiple inside sources around the web chimed in to back up the rumor. A Sony representative only remarked that Sony doesn't comment on rumors and speculation. Meanwhile, DriveClub design director Paul Rustchynsky is only saying that he has nothing to add. If the game does get pushed back to the spring of 2014, it doesn't bode well for developer Evolution Studios. After the Watch Dogs delay wrecked Ubisoft's share prices, there'd have to be a pretty darn good reason for anyone else to ditch a launch day release. Still, we're hearing the same thing from a lot of sources, so this delay could be happen. At this point let's just hope that none of the other next-gen launch titles decide to join the club.